Mark Reichelderfer, MD heads the Inflammatory Bowel Disease Clinic as well seeing general GI patients for consultation and gastrointestinal procedures. He also provides services through our Liver and Pancreas program. 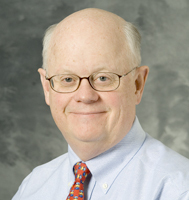 Dr. Reichelderfer's research interests include improvement in diagnostic imaging and therapy for inflammatory bowel disease, colon cancer screening in average-risk and high-risk populations, improved genetic screening for colon and other GI cancer in at-risk families, nutrition and celiac sprue.